Phone 01633 26 28 30 or contact us online to make a booking or find out more. Barefoot news ... What's happening? Please contact us about our workshops, parties or other offerings. Ladies Night the next ladies only evening of pottery painting fun is coming soon feel free to contact us for more information or to arrange a private session at another time. See the calendar for future pottery events. Make a pot on the potter's wheel at our have-a-go "clay day" on the first Saturday of the month. Throwing throughout the day, 10am — 3:30pm, £15 each, approx. 15 minute sessions. Please book. Invitations: Having a party with us? Check out our new pot painting party invitations [pdf, 250kB], suggestions on using them on our kids pottery party page. Clay we are now stocking a dual purpose earthen/stoneware clay "School Buff" as well as an air-dry (nylon) clay; please call to check stock levels before coming to the studio to purchase. Potters wheel Barefoot now have a portable electric pottery wheel available to rent/hire we also have manual treddle wheels to hire; take it home or use it here. Pottery painting is fun for all the family, young and old alike. 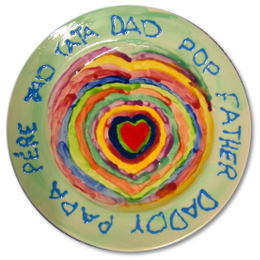 We at Barefoot Ceramics™ provide a fantastic opportunity for you to create your own unique design on a piece of ceramic pottery (there's a huge range, well over 100 pieces of pottery to choose from). Standard studio [session] fees are £4 for each painter. A family of four is £12. Pottery starts at £3, collectibles £8, plates from £10, mugs from £8. 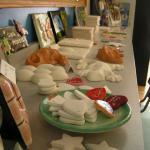 Barefoot Ceramics has a great range of pottery shapes for you to paint-your-own design on to. Our ceramics include plates, platters, candle holders, figurines, animals, piggy banks, collectables ... come to our studio and see for yourself. There's something for everyone, guaranteed. The ceramics we use are called bisque — which means 'baked twice' (it's from the Latin!) — just like a biscuit. 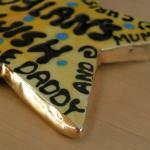 The ceramics have been fired once in a kiln ready for you to paint on a design. When you're done we add a clear, protective, glossy glaze by firing the bisque for a second time ... leaving you with a treasure that will last. We do children's parties, adult's parties, hen nights, have clay workshops, visit schools and community groups, design wedding signature plates, other pottery painting on commission and lots more! Get in touch if you're curious and we can discuss some possibilities with you - whether it's a clay workshop or a session painting ceramics, a gathering of friends or a piece of pottery for a family celebration ... take a look at the gallery as well for an idea of how other customers have had fun with us. 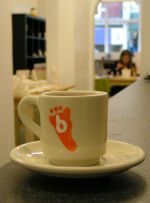 Call us on 01633 26 28 30 for more information; send an email to fun@barefoot-ceramics.co.uk or use our online contact form.